Prime Minister Nawaz Sharif, while addressing a farewell ceremony on Thursday in the honour of Army Chief General Raheel Sharif, said the latter proved himself as the best army chief with his hard work and dedication, DawnNews reported. The premier during his address acknowledged and appreciated the services of Gen Raheel Sharif and his family for the defence of the country. “General Raheel belongs to a family which is second to none when it comes to gallantry and heroism. They have a tradition of serving the nation and laying down their lives in the line of duty,” he said. The Prime Minister said this sense of duty and unconditional dedication and commitment to our motherland had also been evident in the person and career of Gen Raheel ever since he joined the 54th long course in Pakistan Military Academy. “I always consulted General Raheel Sharif for strategic advice and will keep consulting with him in the future,” the prime minister added. Nawaz said this sense of duty and unconditional dedication and commitment to our motherland had also been evident in the person and career of Gen Raheel ever since he joined the 54th long course in Pakistan Military Academy. “His journey from a young, devoted and brilliant cadet officer to the Chief of Army Staff is marked by all the hallmarks of professional distinction and excellence,” he added. The premier said it was under Gen Raheel’s leadership that Pakistan’s armed forces confronted not only external threats but also the menace of terrorism. “I am thankful to Prime Minister Nawaz Sharif for extending full support and such generous words for me,” said Army Chief General Raheel Sharif. On the occasion, Nawaz also held a one on one meeting with General Raheel. The ceremony was held at PM House. 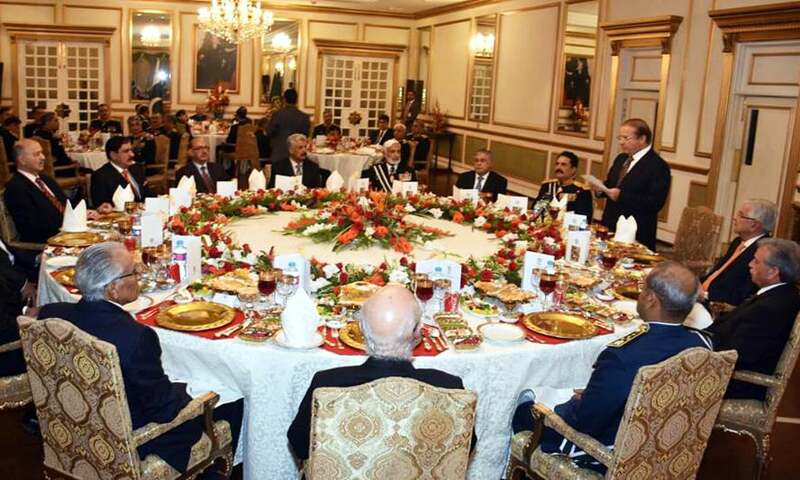 Members of the federal cabinet, services chiefs and senior civil and military officers were present in the dinner.